Quran 5:51 – Can Christians And Jews Be Friends With Muslims? When the Arabic word ‘awliya’ is translated into English as ‘friends’ (Quran 5:51), this verse appears to discourage friendly relations between Muslims, Christians and Jews. This interpretation has been accepted by some. But, many Muslim and non-Muslim scholars favour that the Arabic word ‘awliya’ should be interpreted to mean ‘guardians’, ‘allies’, ‘patrons’ and ‘protectors’, not ‘friends’, as some who have suggested. In addition, Quran 5:51 does not allude to all Christians and Jews, it only refers to those adherents who were at war with the Muslim community, 1400 years ago. The following Quranic verse proves that 5:51 only refers to those enemies who are at war with Muslims and that they should not be befriended or make alliances with. 72 According to most of the commentaries (e.g., Tabari), this means that each of these two communities extends genuine friendship only to its own adherents – i.e., the Jews to the Jews and the Christians to the Christians – and cannot, therefore, be expected to be really friendly towards the followers of the Qur’an. See also 8:73, and the corresponding notes. 756. The verse should not be construed to prohibit or discourage just or benevolent treatment of Jews, Christians and other disbelievers (60:9). It refers only to those Jews or Christians who are at war with Muslims and who are always hatching plots against them. CAN MUSLIMS AND JEWS BE FRIENDS? There are verses in the Qur’an which suggest a negative answer to this question. The first verse appears in 5. 51 of the Qur’an and says, ‘O, you who believe, do not take Jews and Christians as awliya. They are awliya to one another, and the one aming you who turns to them is of them. Truly, God does not guide wrongdoing people’ (5.51). The word awliya (sing. Wali) is commonly translated as ‘friends’. The verse appears to be a very clear statement opposing friendly relations between Muslims, on the one hand, and Jews and Christians, on the other. However, while it is true that one of the meanings of awliya is friends, it also means ‘guardians’ and ‘protectors’. According to many of the traditional commentaries on the Qur’an we are told that this verse was revealed at a particularly difficult moment in the life of the early Muslims community, and here it is necessary to describe the situation of the Muslims at this time in Arabia to put verse 5.51 within the right context. Qur’anic commentators do normally link verses with the particular context in which they were revealed, since it is this that gives them a guide to how they should be interpreted. Before 5.51 was revealed, Muhammed and the Muslims had just migrated as a community from Mecca to Medinah. They had done so, according to the Islamic account, because of the persecution to which they were subjected at the hands of their fellow tribesmen and relatives in Mecca. which the Qur’an claims was originally built by Abraham and his son, Ishmael, as a temple to the one God, before the corruption of religion in Arabia hid the monotheist message of Abraham and his successors. The prospect of the bottom falling out of the idol business could not have enthused those who made their living in it, so it is hardly surprising that Muhammed faced considerable resistance at the beginning. Muhammed and his small band of followers were eventually expelled from Mecca and found sanctuary in Medinah. According to the commentaries, it was not long after this migration to Medinah that verse 5.51 was revealed. Specifically, we are told that this verse came down around the time of the battle of Badr (3.123) or perhaps after the battle of Uhud (3.152-3). In these early days, even though the Muslim community continued no more than perhaps a few hundred people and had already Mecca, the Meccans continued to challenge them militarily, and these two early battles, as well as others, were crucial events in the history of the early Islamic community. In conclusion, when we examine the passage in its historical context, one sees that Q. 5:51 prohibits Muslims from making alliances with Christian and Jews who are at war with Muslims. Reading 60:1 gives more weight that 5:51 is only in reference to those Christians and Jews fighting Muslims. 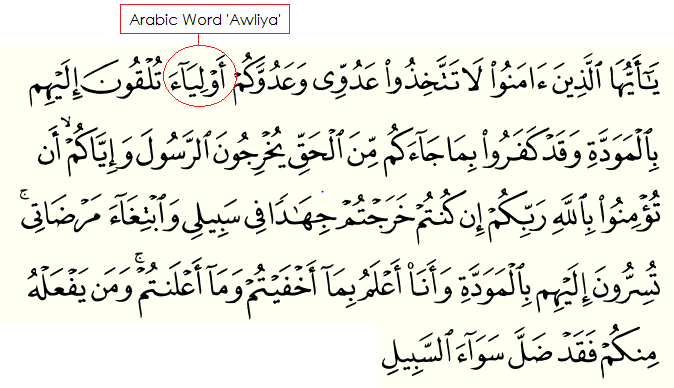 Moreover, Muslim and non-Muslim scholars also stated that the Arabic word ‘awliya’ should be translated as ‘allies’, ‘guardians’ and ‘patrons’, not ‘friends’ as some who have suggested. It is astonishing to see how Christian extremists, and Zionists love to cherry-pick verses out of the Quran in order to support their conclusion that Islam endorses violence against the innocent. Sadly, the ignorant, bigoted folk spew this further to the masses that Islam is a religion of violence. 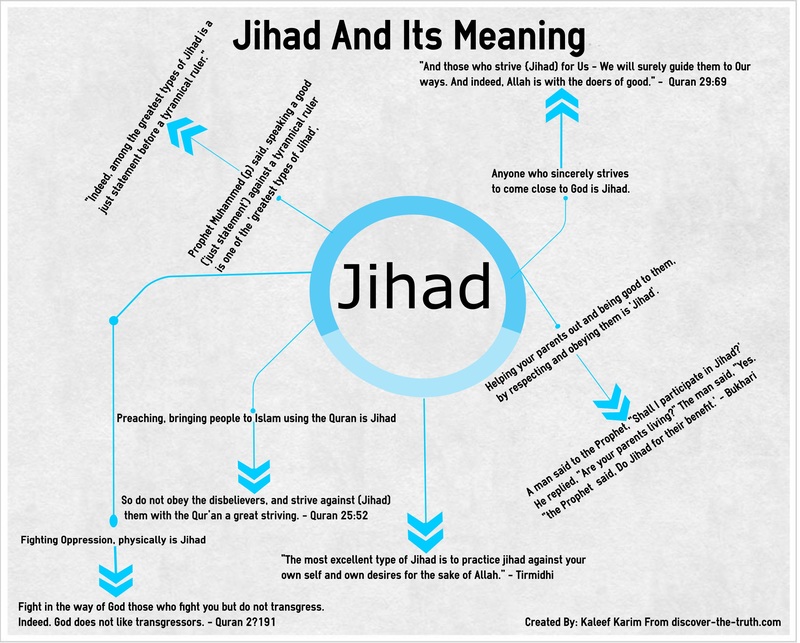 Let’s be clear – Muslims are never ordered to fight against the innocent. Neither the Quran nor the Hadith endorse violence against the innocent. However, as I have examined in many of verses in their historical context, the Quran does allow people to fight back in self-defence, in order to repel oppression, persecution and tyranny. Quran 9:29 Fight those who do not believe in Allah or in the Last Day and who do not consider unlawful what Allah and His Messenger have made unlawful and who do not adopt the religion of truth from those who were given the Scripture – [fight] until they give the jizyah willingly while they are humbled. From that historical point, Quran 9:29 was a war of self-defence. If the Muslims had not done nothing and sat back, the Muslim community as a whole would have been wiped off in Arabia, by the Byzantine (Romans) and other enemies. Tabook is a place between Wadi al-Qura, in the Hijaz, and Syria. The reason for this battle was that the Byzantines had gathered a huge number of troops in Syria, including the tribes of Lakhm, Judhaam, ‘Aamilah and Ghassan, who were Christianized Arabs. They did so because Heraclius intended to attack Madeenah and put an end to the state that was developing in the Arabian Peninsula, as the news of this state and its victories had filled Heraclius with fear and terror. So theProphet ordered the people to prepare for a campaign. That was a time of great and intense heat. The sincere Muslims responded willingly, but three of them remained behind, even though their faith was sincere. The Prophet commanded the rich to provide equipment for the army, and they brought a huge amount of money. Abu Bakr brought all of his wealth, which was forty thousand dirhams. Umar brought half of his wealth, and Uthmaan gave a large amount in charity that day equiped one-third of the army. The prophet prayed for him and said, “Nothing that Uthmaan does can harm him after this day.” A number of the poor Sahaabah came to him who had no animals to ride, and the Messenger said, “ I do not have anything that I can give you to ride.” They turned away with tears streaming dwn their faces because they did not have the means to prepare themselves to join the army. Eighty-odd of the hypocrites stayed behind, and a number of Bedouin gave invalied excuses, but the Prophet accepted them. All the above evidence refutes the assertion made by Islamophobes, that the Muslims fought the Jews and Christians (Byzantines/Romans) for no reason. According to bigoted Isamophobes, Muslims are somehow bloodthirsty animals, and just want war with everyone who is not Muslim, but as shown above, these claims are false and expose their deceitful intentions. In conclusion, the Quranic verse 9:29 commanded Muslims to fight only those that were involved in aggression against them, as shown by its historical context. Muslims only fought the Byzantines in self-defence, to save the themselves from oppression and extinction.